I have not watched the NBA consistently since around 2004. The year the Pistons won the chip. I remember very vividly how much I liked to watch them play, together. Plus who did not love hearing John Mason croon out “Deeeee-troit Basketball” over the PA system a few times during the course of a game. Last night took me back to those days. The days when I would sit in front of a tv for over two hours watching men run up and down the court. The days when I would squeal with delight when a player made a play that would have me hopping out of my seat(ala Ginobli throwin it down on Bosh). The days when basketball was played as a TEAM. 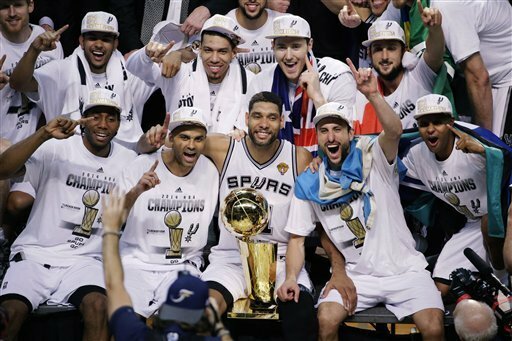 Watching the San Antonio Spurs dominate the NBA Finals was a thing of beauty. The passing, the shots, the unselfish play, the adjustments, the patience, the coaching…just beautiful. I have never seen the game of basketball executed so beautifully. The Spurs are the type of team I grew up watching. In the 90s, I loved watching the Bulls play. I was a “fan” of them just like everyone else. I enjoyed watching them execute the triangle offense with so much precision. While they had a dominant force in Michael Jordan leading the way, everyone, including MJ, played their role and they played it well. When the NBA started shifting from the team game to having one major superstar, a few semi-stars and a bunch of bench fillers on the team, I checked out. There was nothing enjoyable about that style of play. So back to last night. Here I was, gleefully, watching the Spurs put on a clinic, reminiscing on the old days. Happy to see old school basketball prevail. I think it is safe to say only a handful of people around the world picked the Spurs to dominate the Heat. Shoot, I did not even see many people picking the Spurs to win(I did) which was baffling considering they were 25 seconds away from a championship last year. 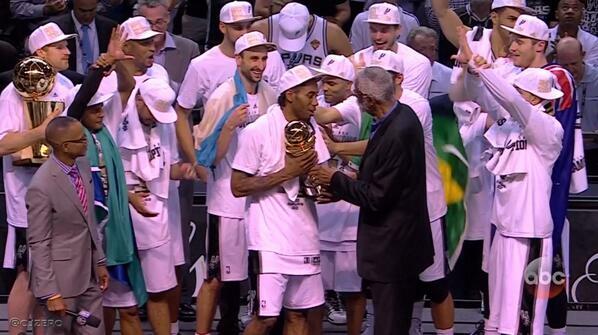 However, the Spurs made it obvious in Game 1 that they were seeking three things: revenge, redemption and a fifth ring. Check. Check. And check. 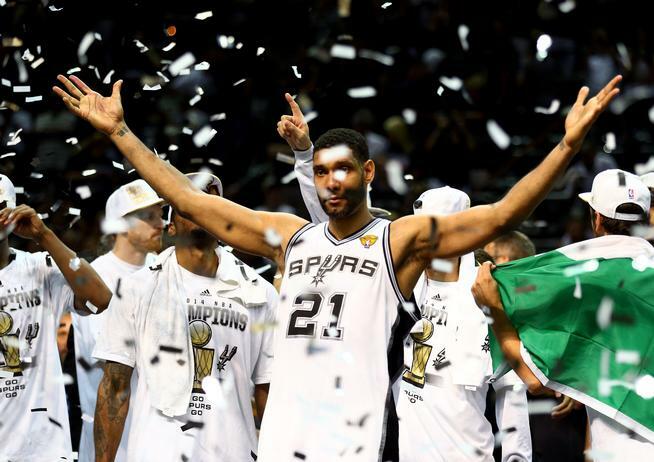 From the rejuvenated Tim Duncan to the elusive Tony Parker to the sparkplug Manu Ginobli to the silent assassin Kawhi Leonard to the reliable Boris Diaw to the dagger Patty Mills to the trigger Danny Green to the confident Tiago Splitter to the mastermind Gregg Popovich, the Spurs executed the very finesse that is basketball. The game is team first. It is next man up. It is fun. It is resilient. It is exciting. It is selfless. That is Spurs basketball. However as good as they are, I heard so many people moaning and groaning about them playing in the Finals again that I have to wonder if we have become so accustomed to only being able to equate success with individuality that we have failed to realize that success often comes in the form of a team? Whether it is your family, friends, co-workers, neighbors, church family, etc, there is often a group of individuals that pushes and holds us up as we climb the ladder of success. The joy I saw on the Spurs bench was nothing short of a complete team celebrating in an accomplishment that they all contributed too. 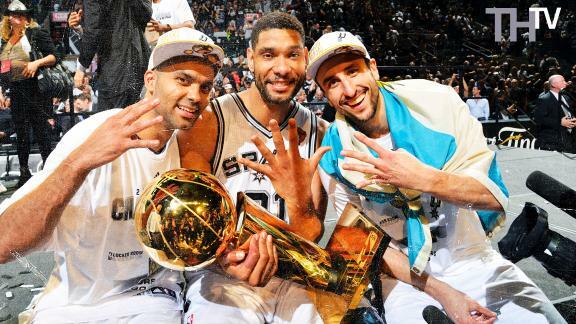 And hopefully, Timmy will not retire and they can do this again next year. Fingers crossed.